Wondering how a fruit like banana can be your computer key? Its not that banana will act as a fake key, but it will be a working key as well. By just putting a finger or even leg on the banana, it will work like the computer key denoted by it. This seems unbelievable, but science has made it possible now. Suppose, in a computer game, arrow key (↑) acts as the key to make the character in the game to jump. Now, if we can somehow make the banana as the arrow key, than by simply touching the banana, the same character in the game will jump. This is what has been achieved by science already, and anyone can now make anything (must be a conductor of electricity) as computer keys by using an electronic kit (also called invention kit) known by the name Makey Makey. Here is a nice video review of this product. 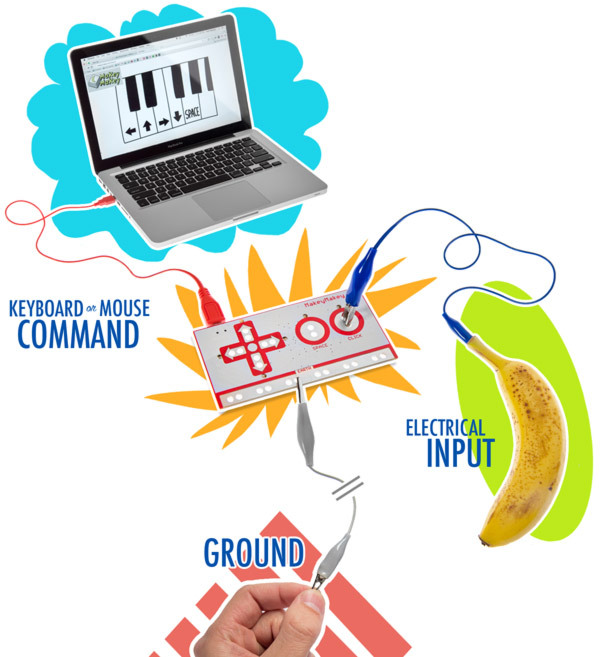 This Makey Makey kit is now available for purchase on many websites including Amazon . Just you need to purchase this electronic toy kit, and once you get it into your hands, read the instructions manual, given along with this product, and you are ready to go. You don't need any programming experience or need to install any software. The electronic kit will contain a board (also called HID board whose full form is human interface device) and on the board there will be different options to insert alligator clips at different points (inputs) on the board. Each point on the board acts as a particular type of computer key, and that is also mentioned on the board, which computer key it represents. Alligator clips are actually attached, on both sides of several thin cable wires, provided along with the kit. These cable wires act as a medium, to connect a particular computer key to anything which you want to make it as a computer key, like apple, or banana, or lemon, or orange etc which are all good conductors of electricity. In a way, the HID board now will act as the keyboard, instead of the real keyboard on the computer, and things like bananas or apples will act as its keys, and your computer will now work through these eatables. Even its possible to make staircases as keys to play piano on your computer. There is no end of fun through this technique. Suppose, one particular point on the board represents the computer space bar key, than one end of the thin cable wire is connected to this point, and other other end is inserted into an apple (say). Now, the apple will act as the space bar for the computer you are using, and this is how it works. Alligator clips attached to wires are actually sharp enough, to insert them in anything, desired to be acting as a key. But another point is that, we also need to connect the electronic board to computer itself, and that is done through the USB cable provided along with the kit. This gadget is perfect to gift someone who is nearer and dearer to you. Just watch this promo video to get more ideas about this latest gadget product for the new generation. This USB fan shows a clock display on the area of it's two rotating blades once switched on. Clock can be used to see the time. Also a helpful product to cool oneself while sitting in front of the computer. It can be connected via USB to a computer or a laptop or any device with USB port. Four robotic toys that can be controlled by hand gestures. Just use your hands to direct them as you like. This robotic toy can even be programmed to pour milk and serve cookies. This Intel Compute Stick can help you to use your television as a computer with an operating system. This graphic tablet can help kids to draw on computer using a stylus pen. No need for mouse or keyboard. This scanner mouse can scan pictures and text in books and save it in real time on computer. This gaming board and relevant app let you make your own computer games and play. Just fold this unusual mouse 180 degree in below direction and it will connect to your computer. It works 1-3 months with a single charge. These electronic blocks (called makerbloks) let you solve puzzles and problems of a character in an app on computer. No mouse or keyboard needed.